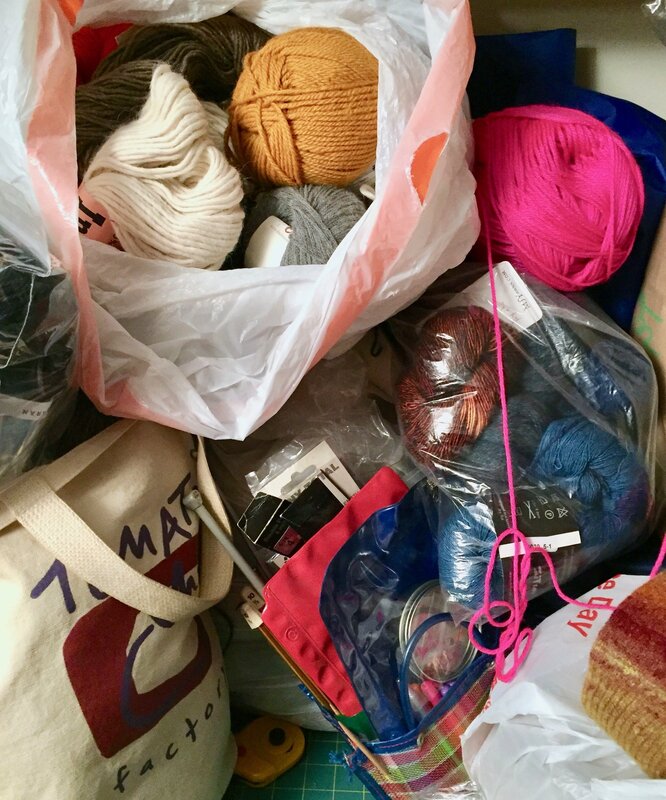 Do all yarn enthusiasts have messy, project-filled homes like mine? As a knitter, crocheter, spinner and circular sock machine person, my house can get messy. Many of you know I’ve been maintaining multiple active projects. For each of them, there project needs a place to be rest when not being worked on. 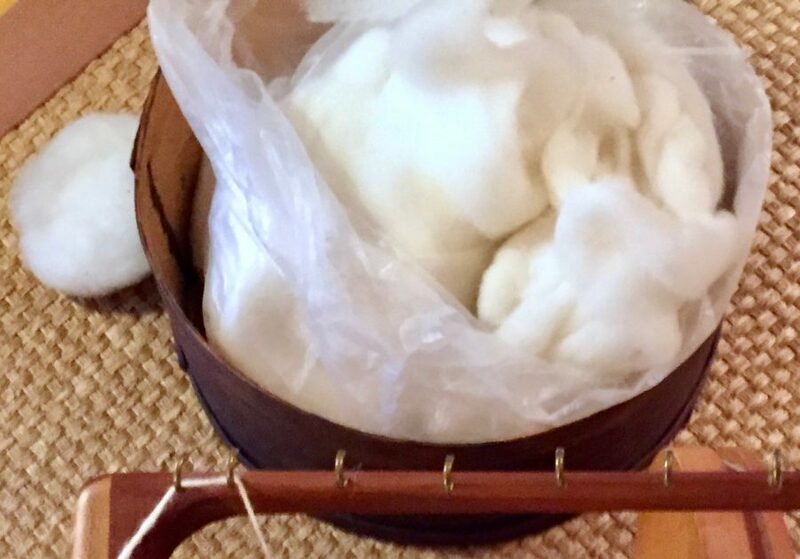 Yarn, tools, fiber, machines. And then of course, photo shoots for the blog are necessary. Back drops, lighting… Well, you get the idea. I live in a townhouse that technically has about 1,800 square feet. This does not include the walk-out/finished basement, which is where the majority of my “mess” is kept. The home also needs to accommodate a husband and a cat. The chair and hassock in which I watch television is almost always adorned with at least one knitting project. Plus, it requires a lamp and many necessary tools close by. The living room is where I usually spin. So it usually has a wheel and a bag of fiber. The couch in that room usually has at least one knitting project on it. Fortunately, I have a very accommodating cat and husband. One recent tidying effort, so neighbors don’t call the Hoarders people, was to find a great storage vehicle for my spinning fiber. 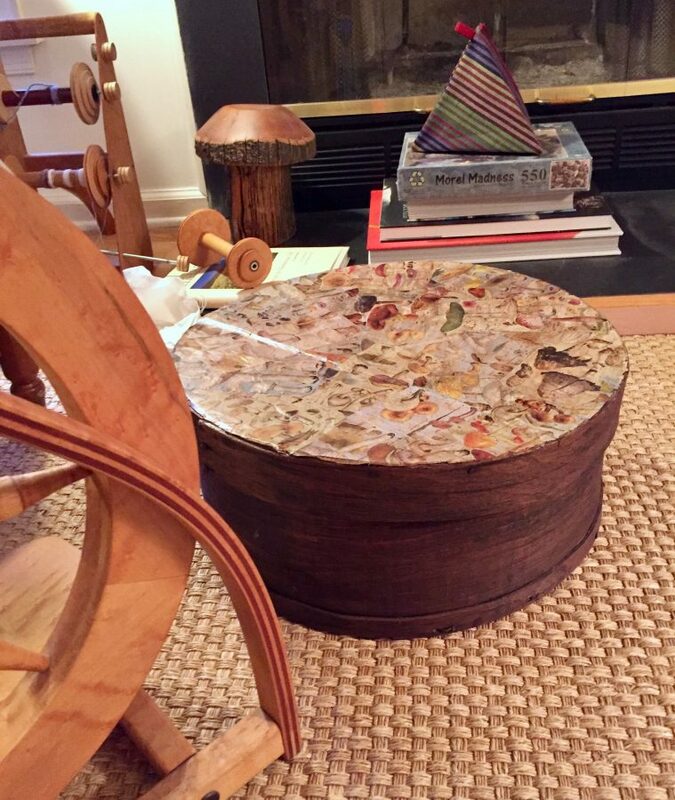 We found this lovely cylindrical Shaker-like box at the flea market. 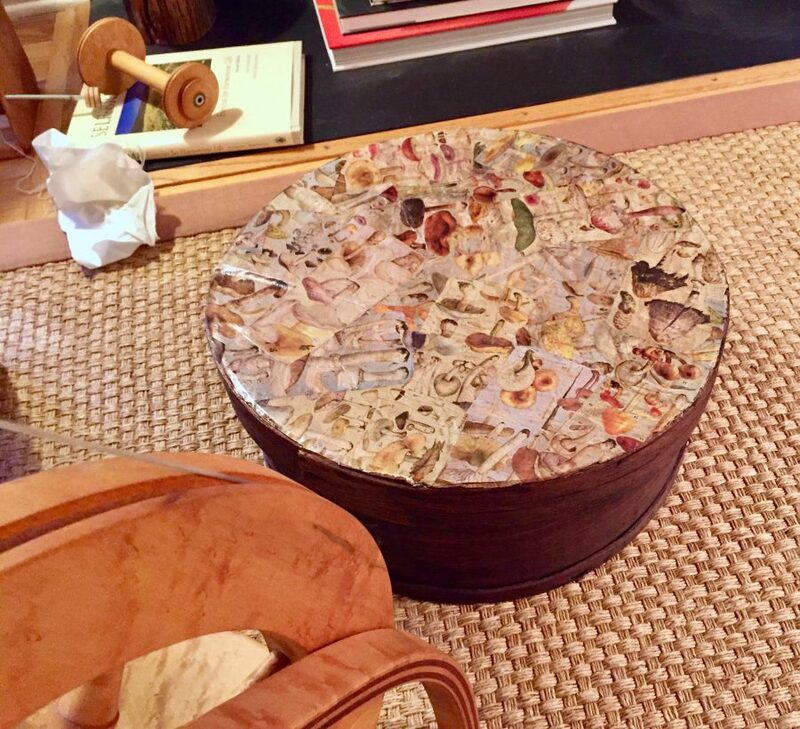 We really bought it because someone had decoupaged a bunch of mushrooms on the top. So now, whenever I’m not actively spinning, the roving/top/sliver I’m working on doesn’t have to sit out on the floor. I know it’s one small step. But it was praised highly by both the husband and the cat. Having finished the latest CSM socks, I’m back down to three works-in-progress. The Tilt Cardigan has been put on the back burner while I focus on the other two. For now. I’m almost finished with the first bobbin of singles on my spinning project. I’m really loving Tommy’s Preferred Blend. 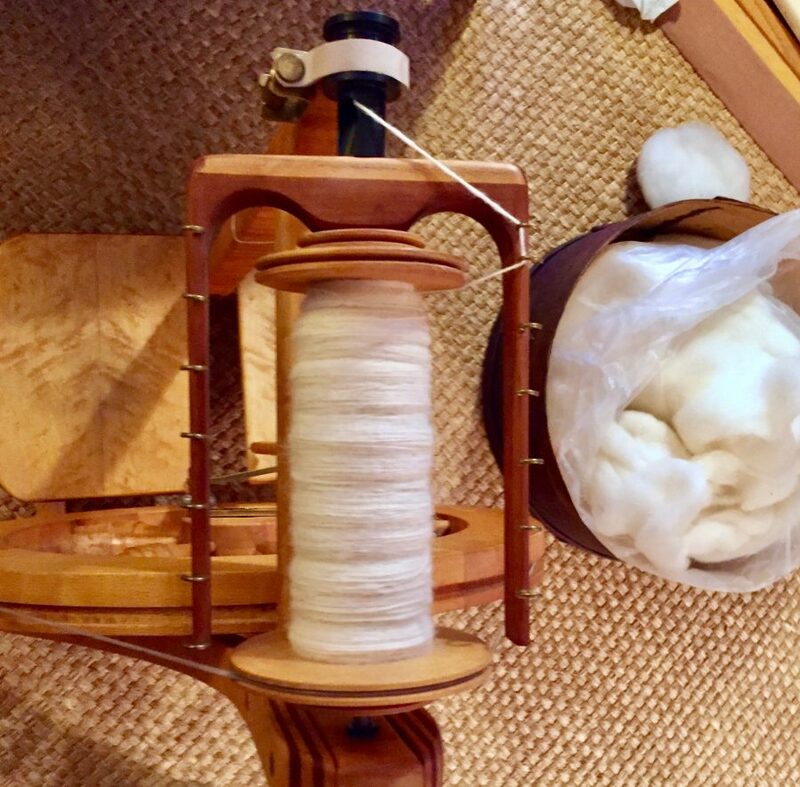 It’s challenging to spin and creates a beautiful yarn. The spun yarn is lofty, soft and has a fine halo of fuzz about it that I love. I’ve also made a lot of progress on the Biased Striped Stole. In fact, I just measured it and I’m over halfway through. I’m not thrilled with the colorway, but I’m sure someone will love it. I am glad I went with the squash blossom colored yarn. 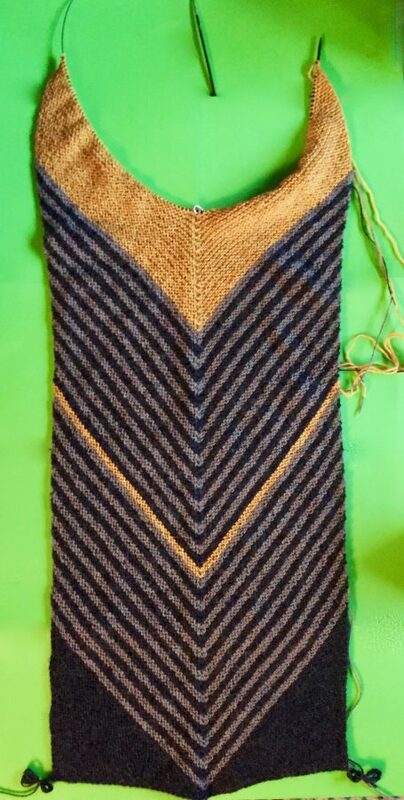 We’ll see how it looks with alternating stripes of the lighter colored yarn. Now I’m off to do a bit of housecleaning. Perhaps it’s an optical illusion, but there appear to be more thin stripes above the thin yellow stripe,than below it. Maybe that’s why the colorway is throwing you a bit. But, then again, it could just be my eyes. I enjoy your blog. Thanks for your postings. I hadn’t noticed that! It is just an illusion, except the if you pair the brown with the taupe stripes, the first brown stripe is blended with the block of brown at the bottom. Mostly, I’m not overly fond of this general yellow, brown, tan combination. Too reminiscent of an afghan that Thaddeus’ grandmother might have crocheted.